Microsoft’s oft-lamented browser, Internet Explorer 6, may finally be put to rest. This will make many a Web developer happy – but also Microsoft itself. Web analytics company StatCounter claims its latest global data set shows IE6 usage in the US and Europe has fallen to 4.7 percent of the market from 11.5 percent a year ago. 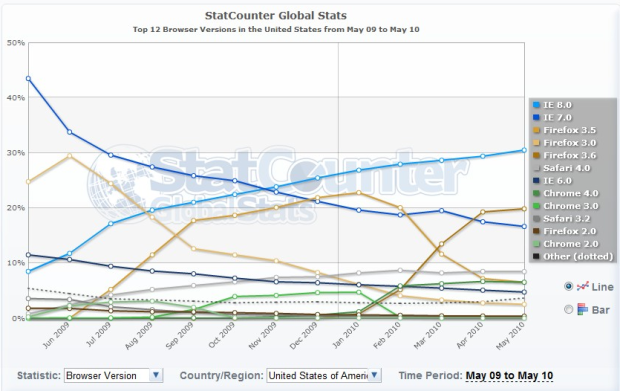 That said, IE8 usage in the US increased to 30.5 percent in May (up from 8.5 percent a year ago) while IE7 is currently at 16.6%, so it’s not all bad news for Redmond. Firefox 3.6 comes in second in terms of browser usage in the US, with almost 19.85%, while Google Chrome 4.0 only has some 6.5% of market share according to StatCounter. Update: Results from Net Applications paint a similar picture, although different numbers: the firm has Internet Explorer’s overall share dropping to below 60 percent from 67 percent and Firefox at the 24 percent mark, up 2 percent from the same period last year. NetMarketShare has Chrome’s usage at 7 percent in May, up from 3 percent a year ago. Still according to Net Applications, Internet Explorer 8’s share in May surpassed 31% among Windows customers, the only OS on which Internet Explorer is available, and 28.94% share across all operating systems. Undoubtedly, major Internet services dropping support for IE6 on an ongoing basis (YouTube, Google Docs and Sites, Google Reader, etc.) are advancing its impending death. But the reason Internet Explorer 6 is still around in the first place is likely because of some large corporations still clinging on to it despite massive security issues with the ancient browser. StatCounter also adds that Africa and Asia, where IE6 still has 20.8% usage, are making it harder to kill support for the browser already. Hopefully, everyone will soon see the light.